Phoenix's Mexican American community dates back to the founding of the city in 1868. From these earliest days, Phoenicians of Mexican descent actively participated in the city's economic and cultural development, while also fiercely preserving their culture and heritage in the thriving barrios, by establishing their own businesses and churches. In 1886, Henry Garfias became the first member of the Mexican community to be elected a city official. The 20th century saw the creation of organizations, such as La Liga Protectora and Sociedad Zaragoza, that gave a stronger political voice to the underrepresented Mexican population. In 1953, another member of the Mexican community, Adam Diaz, was elected to city council. As the century progressed, the Mexican American population grew and expanded into several areas of Phoenix, and today the substantial community is flourishing. 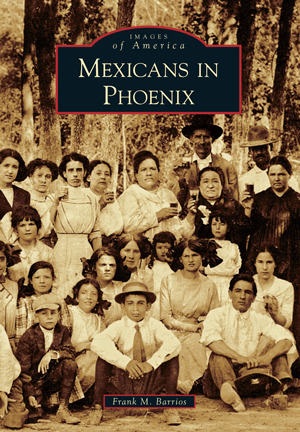 Author Frank M. Barrios is a native of Phoenix and a descendant of one of the valley's early pioneer families. As president of Phoenix First Families, a state organization for families that arrived in Arizona prior to 1912, Barrios is actively preserving his own heritage. In this volume, he showcases more than 200 photographs gathered from the private collections of pioneer Mexican families, as well as his own personal collection.